Edge Tape for Table Tennis Bats - who needs it and which are best? Some players use edge tape on their table tennis bats, some don’t. Do you really need edge tape? Is it purely cosmetic, or are there functional reasons for edge tape? Are there different types of edge tape? This article covers all these questions, so that you can decide what to use for your bat. Table tennis Edge Tape, also called ‘side tape’, is used to cover the edge of a table tennis bat. Narrow edge tape covers only the wooden part of the bat, wider ones cover the wood + the edge of the rubber. Although there is no mandatory reason to use edge tape, many players use it to give their bat a neat finish, or to give their bat that extra ‘wow’ factor. Some players also use edge tape to protect the edge of the bat, and for this, it’s important to select the correct one. Are all types of edge tape legal? It’s very bright in appearance, especially when it’s the same a colour as the ball. which may (far-fetched I know!) be distracting for the opponent. So basically you can use anything, just be reasonable and consider the issues above. 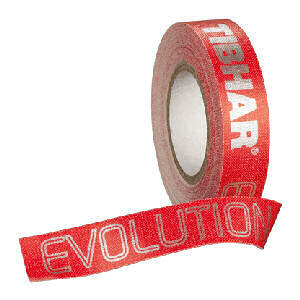 The most common type of edge tape is a cloth-like material with a strong adhesive back, like the Tibhar Evolution tape pictured right. Almost all the major manufacturers make this tape in 12mm width, which is usually enough to cover the edge of the blade, plus the edge of two inverted rubbers. Only a few manufacturers make this in a wider range of widths, like Donic who make it in 6,9,12 and 15mm, which is important if you have a bat with an less common width, like the thick balsa blade, or a thin blade with two pimple rubbers on either side. These tapes are very good, because the material is very flexible and the adhesion is strong, so it easily sticks to uneven surfaces like the rubber edge. If your glue job is less than perfect, and the rubber edge is jagged, this is the perfect tape to cover it up. These tapes also help to hold the rubber edge onto the blade, because that’s where a rubber usually comes loose first. The so-called “foam edge tape” are specifically designed to absorb accidental hits on your bat edge. They are made of a soft layer of foam, usually 1 to 1mm thick, with an adhesive backing. 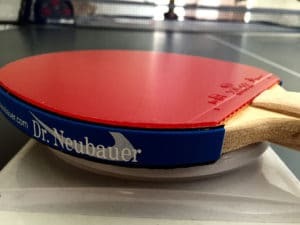 The first ones that came out were made by Dr Neubauer (pictured right), because they have a lot of balsa blades, which are much more prone to damage from accidental hits. Joola and a few others now make them as well. There are a few other types of edge tape, which offer more protection to the bat edge than the cloth tape, but are more firm compared to the foam tape. 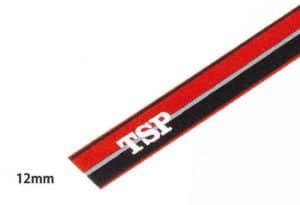 My favourite is one made by TSP as pictured right, called the TSP Feather Side tape which is made of a type of ‘felt’ cloth and is flexible and much thicker than ordinary edge tape, and can therefore offer more protection against accidental damage to your bat. Bright red & black colours with white writing and a silver line gives the tape high contrast, and your bat a real classy look. The adhesive strength is not as high as that of cloth edge tape, because it’s designed for removal and reuse. Putting a cloth tape underneath is usually a good idea. covers up a messy glue job! If you change over rubbers a lot, and glue the old rubbers onto other blades, it’s usually best not to bother with edge tape at all, or use one that just covers the blade edge. This is because usually when an old edge tape is remove, it will take with it bits of the edge of the rubber, which can start to look ugly once you’ve done it a few times. Which is the most common width and lengths? The 10mm and 12mm are the most common width, some manufacturers only make a single width, which would be either 10mm or 12mm. A blade is typically 6mm in width. The great majority of players use two inverted rubbers with sponge thickness between 1.5mm to 2.3mm. Assuming a typical inverted top-sheet is about 1.7mm, a single rubber would add between 3.2mm to 4mm, so two rubbers add between 6.4mm to 8mm. So the typical bat thickness would be around 12mm to 14mm. This is why most players would use a 12mm edge tape, as this covers most of the edge of the majority of bats. To cover the full length of your bat, you need less than 50cm, so that’s why separately-sold edge tape are usually between 45 to 50cm. Roll are typically sold in lengths of 5m, 10m or 50m, which should give you enough to tape do 10,20 or 100 bats respectively. Will my shop put edge tape on my bat when they assemble it? While I can’t speak for all shops, but OOAK table tennis shop does include free edge tape when we assemble bats. We buy our tapes in 50m rolls to make it cost effective, and stock the standard 12mm wide tape for most of the major brands, and other widths for a selected number of brands. Determine the appropriate tape width, to cover as much of the blade & rubber as possible. From the edge tapes at the required width, match the blade brand first. If the blade brand can’t be matched, match the brand of the rubber(s). If neither the blade nor the rubber can be matched by brand, choose the tape that matches the colour(s) of the bat best. Of course if you choose a foam edge tape it needs to be purchased separately. We would still put a standard tape on the bat before we apply the foam tape, because the foam tapes stick much better on the smooth surface of a regular edge tape. Don’t stretch the tape too much while putting it on. You’ll find that tension can pull the tape off over time, and adhesive strength to make it stick back is reduced. If you use a width that’s more than the blade + rubber thickness, the tape will protrude beyond the edge of your bat. Some people use this and fold it over onto the rubber surface, which does help to protect the edges from crumbling, but note that it’s technically illegal for formal competition or tournaments.